In the women’s race, Mani sprinted off the start line to take the holeshot and was soon joined by Maghalie Rochette (LUNA Pro Team) and Kaitie Antonneau (Cannondale p/b Cyclocrossworld.com) at the pointy end of the field. A couple laps in, Mani’s race was derailed when her cassette got tangled up with brush forcing her to change bikes. Mani was able to ride herself back into the top 10, but her sixth place was certainly not the result she was hoping to have on opening day of the 2016 season. Driscoll crossed the line pumping his fist satisfied with second place, only five seconds off the pace of Powers. Suffering in the heat and humidity, Haidet was unable to piece together the race he was hoping to have. Used to more dry environs, the San Luis Obispo resident finished a disappointing 26th on the day. Mani stormed off the front of the race early putting on a clinic for those following in her wake. The 3-time French National Champion and silver medalist at the World Championships in Zolder was on a mission, and she didn’t let anything stand in her way. Stomping on the pedals lap after lap, alone off the front, she seemed to effortlessly put time into her competitors. Within a few laps of the five lap race, she had put 25 seconds into the chasing group of five riders. The men’s race was full of blows, which served to reduce the size of the front group. As the damage was unfolding, Driscoll found himself on the wrong side of the split. When Driscoll rolled into the pit for a bike change, he watched the fastest guys speed away. Driscoll was able to rally back to ninth place – a short distance back from the lead group of five who finished on the same time. The goal of the day for Haidet was to find his teammate’s wheel and hang on as long as he could at the front of the race. Haidet improved his finish by 10 places from 26th on Saturday to 16th on Sunday. For the 18-year old, the men’s field in Waterloo was the strongest contingent Haidet had ever lined up against. At most US races, Haidet usually has a third row start, however with the Europeans taking up places in the front rows, Haidet was pushed back to the fourth row. The devo rider was able to make it to the front end of the race, but as the speed and heat took its toll, Haidet fell out of the top 15. In typical Mani style, the French National Champion went straight to the front and set a high pace during the opening laps of the women’s race. The high speed was enough to reduce the front of the race to only six women racing for the podium spots. In the second half of the race, the lead changed from Katie Compton (Trek Panache) to Mani and then to Kaitie Antonneau (Cannondale p/b Cyclocrossworld.com) who made the final charge to claim victory. Despite racing in the heat of the day, the men’s race got off to a fast start as the large contingent of Europeans pushed the pace. After an hour and seven minutes of racing, it was World Champion Wout Van Aert (Crelan-Vastgoedservice) who took the top honors. Driscoll didn’t have the day he wanted but managed to out sprint his two companions for 12th place. The Jingle Cross Cyclocross Festival was a jam packed event filled with three days of thrilling racing. The action got started Friday night under the lights at the Johnson County Fairgrounds in Iowa City. Not able to race the World Cup, Lance Haidet was the only member of the Raleigh-Clement team to line up for the USAC Pro CX C2. On a brutally hard, muddy course, Haidet finished a disappointing 11th but still enjoyed racing in front of an energetic crowd. On Saturday both Caroline Mani and Jamey Driscoll lined up for the main event of the weekend, the Iowa City World Cup. 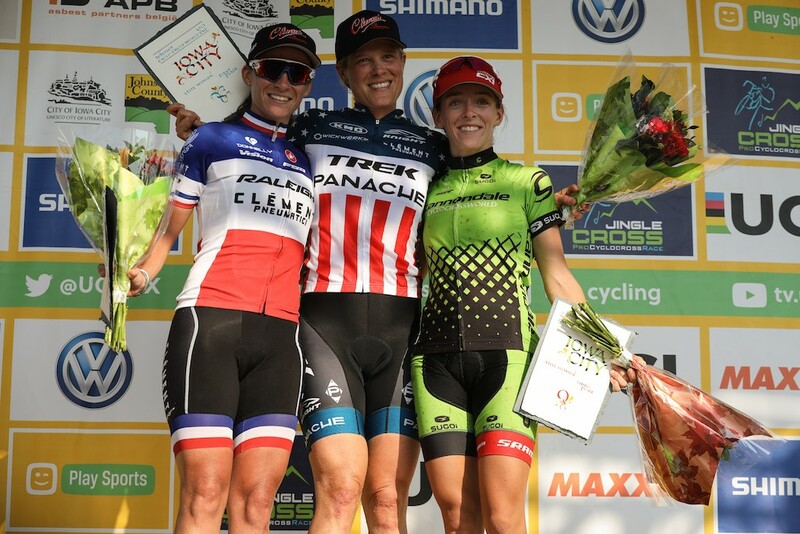 In front of a rowdy and enthusiastic crowd of 10,000 people, Mani pounded on the pedals around a course that afforded little rest to ride her way to second place behind US National Champion Katie Compton (Trek-Panache). In the men’s race, Driscoll didn’t have the kind of day he was hoping to have in front of a US crowd. After a grueling hour race in the hot and humid conditions on a relentless course, Driscoll crossed the line in a disheartening 34th place. By day three of the event, everyone was pretty spent, but the show continued with the USAC Pro CX C1 race on a slightly modified course from Saturday. Mani, showing she had the form but lacking the mental strength, finished fourth. For both Driscoll and Haidet it was a positive change from their previous performances when they finished 14th and 20th, respectively. Haidet made it to the podium as the top U23 in the field. Next up for Raleigh-Clement is the KMC Cross Fest October 1 and 2. All images provided by Meg McMahon.